Andrew and Annie Hubbard are breathing new life onto a multi-generational farm in Princeton, MA. Andrew explained his great-great-grandfather started the farm as a dairy farm, and the dairy operation continued until it reached Andrew’s father. After Andrew’s parents sold the milking herd in 2000, the family kept the farm and started selling wood pellets and bark mulch. Over the past three years, Andrew and Annie have been reintroducing livestock to the farm. They started with beef cattle, then added poultry and hogs. Today, Hubbard’s Farm is home to 48 beef cattle of various ages. Cows are bred to purebred Angus bulls via A.I. In order to maintain a year-round supply of beef for customers, Andrew stretches the calving season out as long as possible. 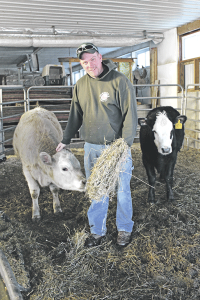 To provide a consistent diet for cattle, the Hubbards make haylage and corn silage and grow about 30 acres of dry hay. To provide a more diverse selection of products for customers, the Hubbards added laying hens, broilers and hogs to the farm. Andrew said their veterinarian helped them connect with a swine breeder, and after learning more about the different hog breeds, Andrew was told people prefer meat from Berkshires. After purchasing both Berkshires and Durocs, Andrew agreed that Berkshires are a superior meat breed. The pigs are raised outside with a hut for shelter, and in addition to foraging, they receive grain. Annie described the crock pot special, which includes beef roasts, country-style pork ribs and chicken and all beef or all chicken cookout specials. The Hubbards are flexible and will gladly adjust the contents of packages to suit individual tastes. Although first-time customers are sometimes overwhelmed with the choices, Annie found that offering a variety of packages provides an opportunity for people to try several meats in various cuts. Hubbard’s Farm uses social media to keep customers informed about what’s available as well as special offers and contests. Visit Hubbard’s Farm on Facebook and at www.HubbardsFarm.com .